We have some friends who host a pumpkin carving party each year, and everyone comes out with their creative and fun carving talents to win the coveted pumpkin trophy. This mummy pumpkin is incredible, but a bit more involved to create than I was hoping to find for our five-year old. Cheesecloth, fabric stiffener... just a bit too much for a backyard party. Cover as much orange as possible with the cloth athletic tape. 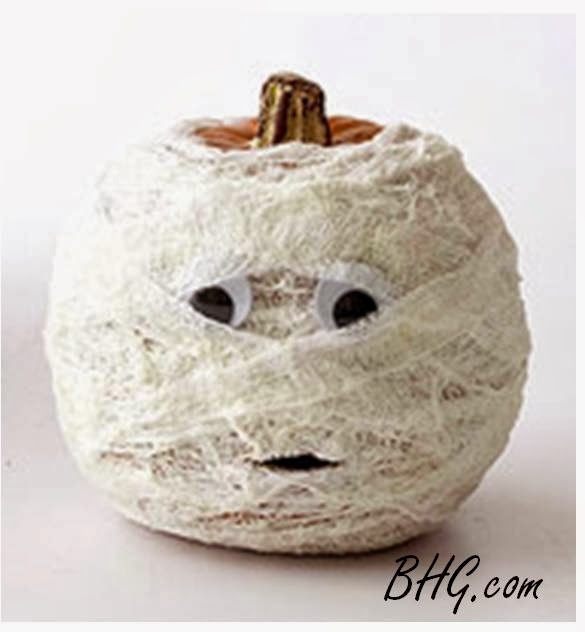 Then wrap the pumpkin with the roll of gauze, either tucking in or gluing down the end. Glue on googly eyes, then draw a face. Embellish as you wish. Amelia's pumpkin mummy is a girl, so she drew eyelashes and tied ribbons on the stem. She created this pumpkin entirely on her own and it looks fantastic! Quick and easy with no knives required.